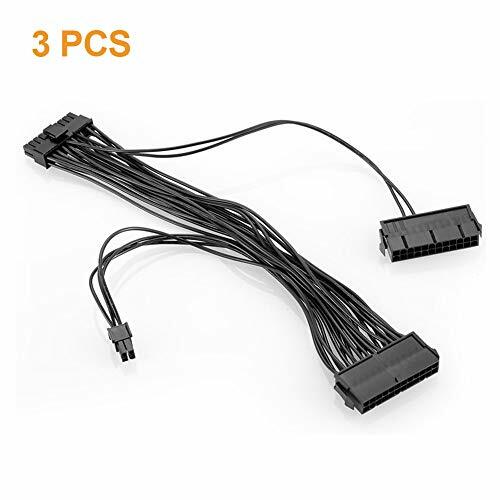 With this 24pin dual power supply adapter cable, allows you to add a second PSU to a single motherboard. Enables use of two power supplies on one motherboard, get more power for your high-end graphics video cards(GPUs) or mining rig without having to upgrade your existing PSU. A cost-saving solution for Ethereum, Bitcoins, Ripple, Litecoin, Z-coins, ETH, ZEC, Zcash and other alt-currencies GPU mining, as well as Dual PSU gaming. This adapter allows you to turn on/off two power supplies simultaneously (please use the outputs from the 24pin power supply only on motherboard, and use the outputs of the 2pin power supply solely for devices ---like hard drive, cd rom, dvd, etc... Please do not mix the power from first and second power supplies).